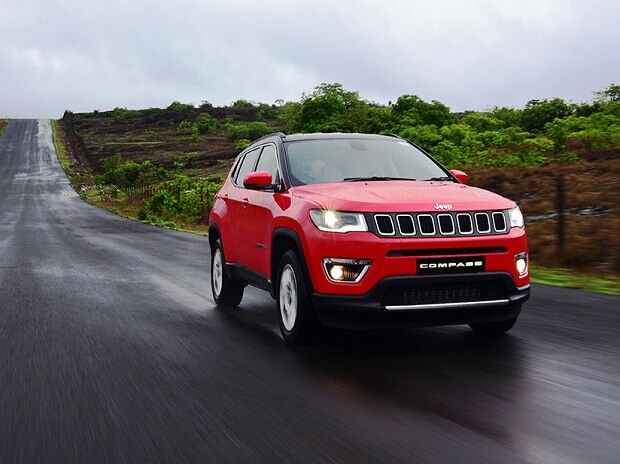 Jeep, an American automobile manufacturer, launched the Jeep Compass in India at a very competitive starting price of Rs 14.95 lakh, ex-showroom price in Delhi. The compact SUV is launched in two engine variants and -- a 2.0 Liter Multijet Turbo-Diesel engine and a 1.4 Litre Multi-Air Petrol engine. The top-end model of the SUV in diesel variant is priced at Rs 20.65 lakh, ex-showroom price in Delhi. The Jeep Compass SUV will be available in Indian market in three trims - Sport, Longitude and Limited. While the base ‘Sports’ variant is offered in all black upholstery, the Longitude and Limited gets dual tone cloth and leather upholstery, respectively. Other features offered in the top trim package are a 7-inch U-Connect high definition touchscreen infotainment system that supports Apple Car Play and Android Auto; Active Drive with Select Terrain Traction Management system allowing the driver to choose from Auto, Mud, Sand & Snow modes and Frequency Sensitive Damping (FCD) that helps to optimise the vehicle's stability. In terms of engine specifications, the 2.0 Litre diesel engine produces 171 HP and 350 Nm of peak torque while the 1.4 Litre Petrol engine churns out 160 HP and 250 Nm of peak torque. The diesel variant comes with a 6-speed manual transmission, whereas, the petrol variant has an added option of 7-speed Dry Dual Clutch Automatic Transmission (DDCT). The Jeep Compass compact SUV will be available with three-years or 100,000 km manufacturer's warranty in addition to a Road Side Assistance package for three years.